I don’t know about you but I can always use a little housekeeping help. I have found that when I take a little bit of time and decide what I want on my desktop, I collect a lot less clutter. This design was made with my FREE March wallpaper. Become part of the community to receive exclusive freebies, news and inspiration, along with a bundle of products just for joining us. 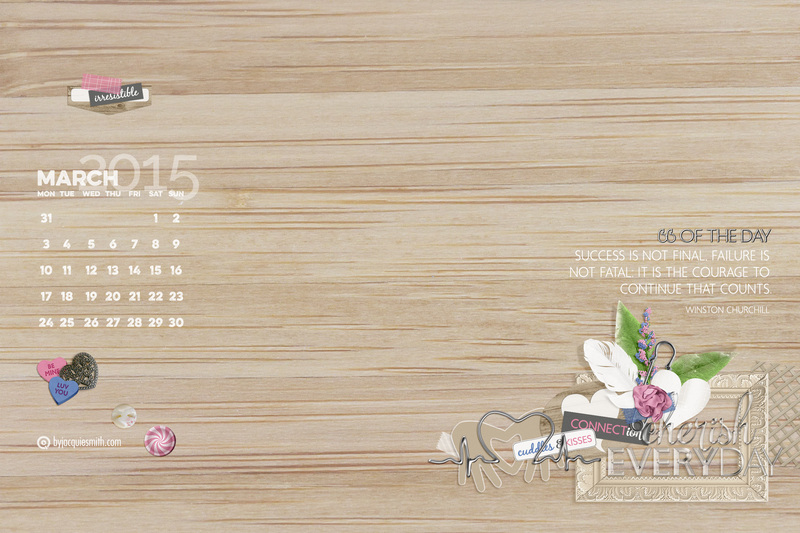 Layout: This month’s wallpaper is of my new bamboo standing desk desktop. The wood is beautiful, fresh and clean. It is a perfect base for you to add your own elements of design and inspiration. I have added some of my favourite pieces from the Everyday February: graphics and an encouraging quote by Winston Churchill: “Success is not final, failure is not fatal: it is the courage to continue that counts“.